I got myself up before the dawn on Tuesday and did 4 miles around my neighborhood. It was cold, but it was calm and clear, with a gorgeous crescent moon above. 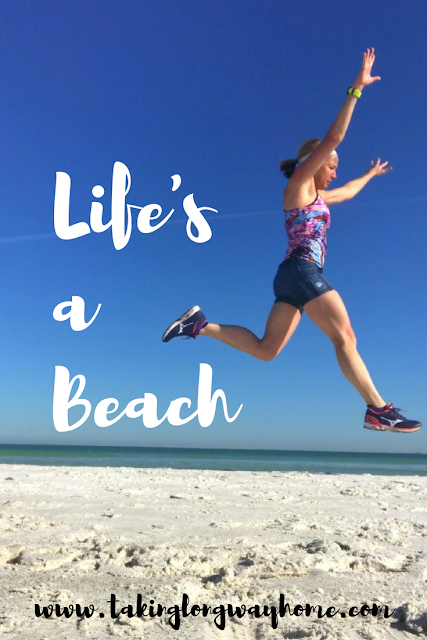 Friday was an almost 7 miler under the beautiful Florida sunshine. On Tuesday, I did Five Parks Yoga Full Body Deep Stretch Basics. Much needed after my weekend runs and Rachel's burpee extravaganza, I felt a whole lot better after going deep. Even better, on Thursday, Mary Beth (remember her from Tutus and Tennies?) came to visit me on the island where I was staying and joined me for a SUP yoga class. 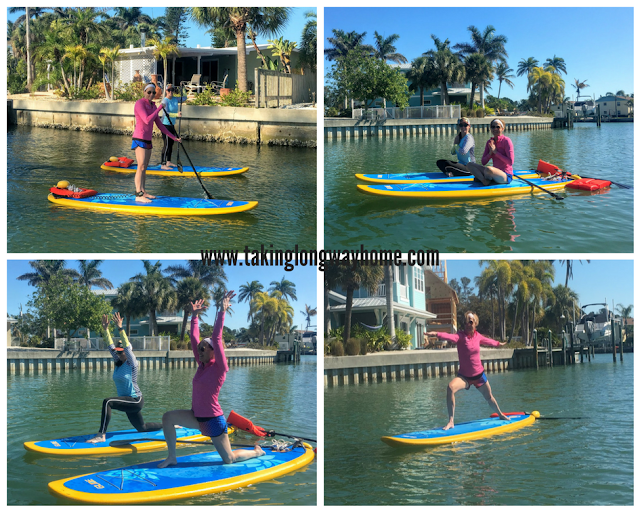 While the poses were just the basics, what makes SUP yoga challenging is trying to stay upright on the board--you use a lot of core strength while moving and holding the poses. 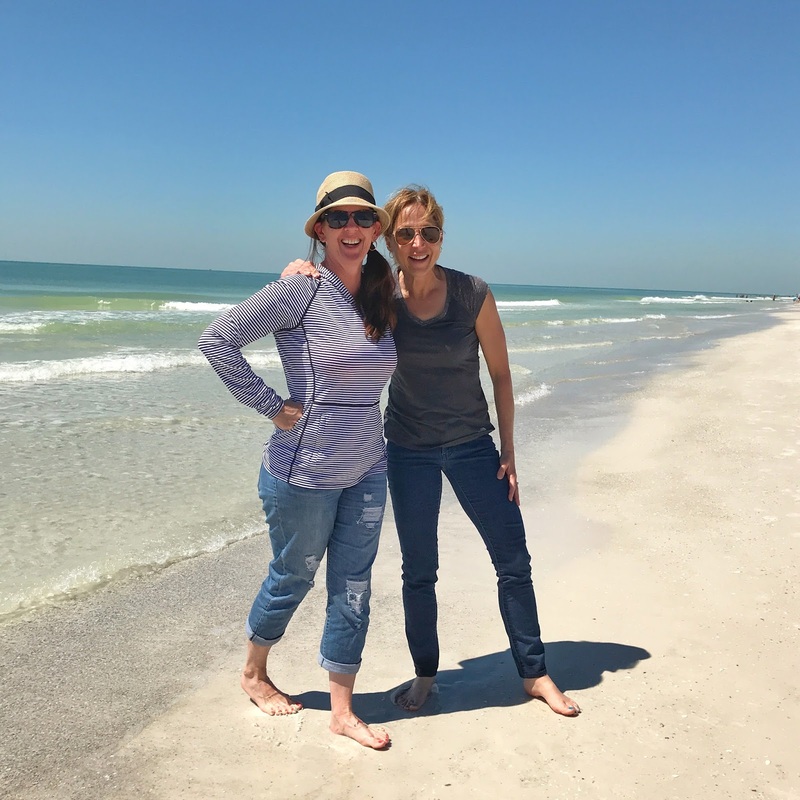 Both MB and I completely enjoyed Rachel's class and if you ever visit Anna Maria Island, please sign up for one of her SUP yoga classes. You won't regret it. No CrossFit this week and I all but dropped out of Rachel's Total Body Challenge after that extreme soreness I experienced last weekend! 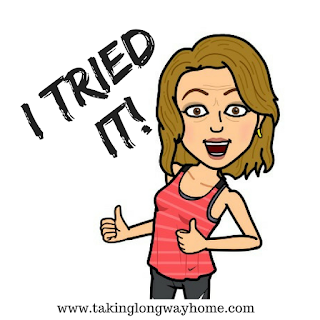 What I did decide is that I will continue doing those run/burpee/walk EMOMs I started last week--I felt that they were beneficial not only for strength but also my endurance. 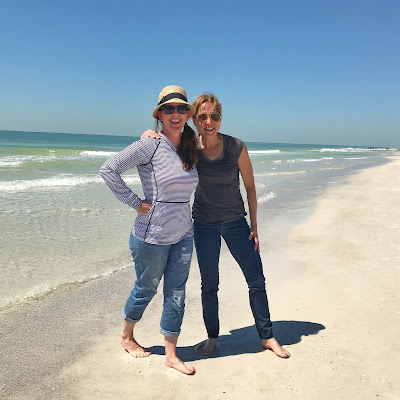 MB and I took a very long walk on the beach and to the shops after our lunch on Thursday, bringing our total steps for the day to almost 11,500--which according to my app was about 9.6 miles. I'm not sure if I believe that but we did a lot of walking! I'm published! 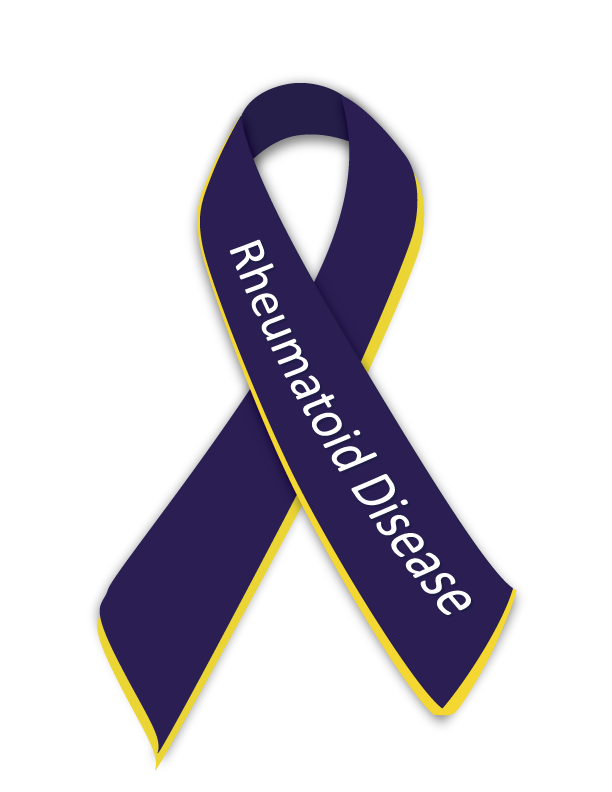 Last week, I submitted my post 5 Positive Ways Rheumatoid Arthritis Turned My Life Upside Down to The Mighty, a chronic illness website. They accepted it and published it! For that pre-dawn run, I finally was able to try out the Knuckle Lights that I won from Darlene several months ago. I'm not a fan of early morning runs in the winter--for one thing, it's cold but it's also slick from ice and snow. I have a headlamp that I've used in the past, but I liked the idea of the handheld lights. The LED lights are really bright and the straps are adjustable, fitting around my hands comfortably. Since I run with my fists partially closed, running with the Knuckle Lights didn't bother me at all. The lights have a wide beam, I was able to see the road clearly and was visible to drivers who were driving towards me. The Knuckle Lights use AAA batteries. There is a rechargeable model as well. When not in use, there are magnets that hold them together. 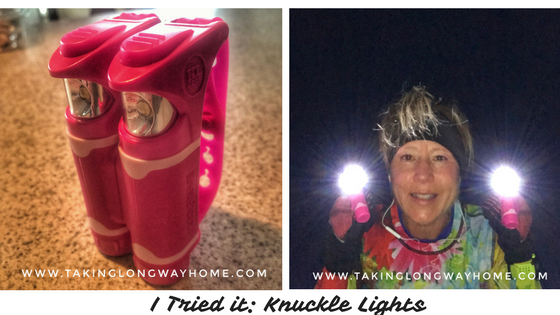 Overall, I really liked them and will use the Knuckle Lights any time I run in the dark! And that's a wrap! How was your week? Any spring breakers out there? I know a lot of people had races and I'm looking forward to reading recaps all week. Did you race? Tell me something exciting about your week! 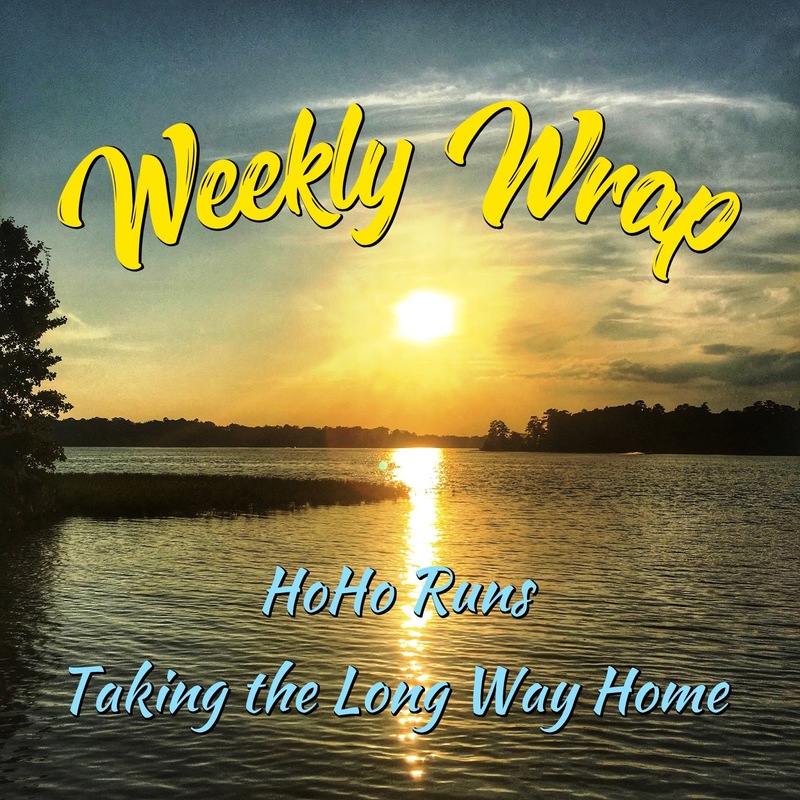 It's the Weekly Wrap! If it's your first time linking you can check out the rules under the WW tab at the top of the blog. Both Holly and I were out of town this week (not together), so please be patient with us as we work our way through all the posts! Meanwhile, we'd be so grateful if you'd take the time to visit at least 3 of the links so everyone feels the love. 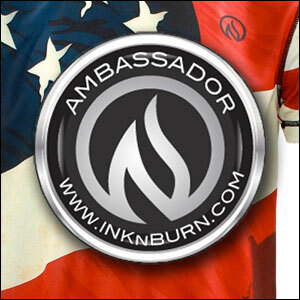 Don't forget to link back to and comment on the hostesses' blogs. 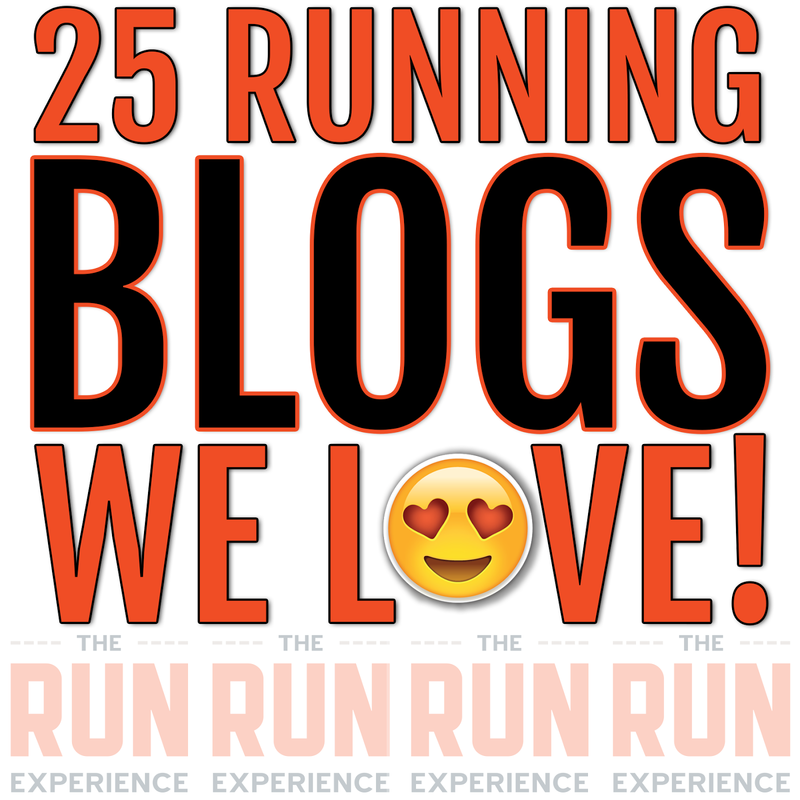 We so appreciate all the support of our fitness bloggers. Have a wonderful week! Yikes. SUP yoga looks really hard! But fun! I can only imagine that you want to put some of the fitness you've stored up to good use! Are there any races coming up? SUP yoga is really more core than anything--you just have to think about ti! It's so fun. I’m glad you were able to get away a few days and relax. Also great you and MB could hang out. I may need the knuckle lights since the time has changed. It’s dark. Again. And, of course I’m going to tell you to sign up for a half. LOL. The yoga on the float looks so much fun, but hard as well. Just popped by at your insta. So cool! Congrats on finishing the Sarasota Half. I was there couple of months back and it was beautiful. It's my second time running it and I'm so glad I did it! I'll have the recap up on Sunday. Dreaming of spring over here too! We're supposed to get snow on Saturday. I did have a great race! It's always nice to run a race on your terms. I have knuckle lights from the first year they came out. They looks to different now and I'd love to get the rechargeable kind because I plow through batteries so quickly that I've pretty much quit using them. I love my rechargeable headlamp! I never bought the original Knuckle Lights--I didn't care much for the design. The new design is great and really functional! The one time I tried SUP, I was petrified of even moving after I got up. Don't ask me why. So I can't even imagine doing yoga on a board! I so need a vacation. I've had a few days off here & there, but the last bona fide vacation I had was UT. Last June. And that is just waaaaaay too long. And we have no plans until July at the moment! I can't just jump into a half. Not unless I'm already trained. 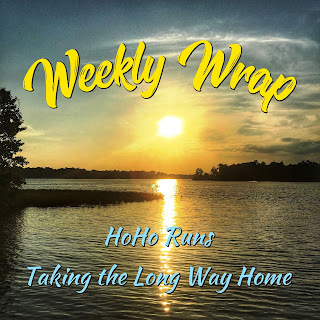 It should be pretty obvious why after I got runner's knee with just 6 weeks of limited exercise -- and most of those weeks still included running. I know people who can & I am just not one of them. Why were you petrified of the SUP? What is the worst thing that could happen? You'd fall in. And climb back on the board. I think you need to do it! Great job with the SUP yoga! Ive never tried it but it seems a bit scary! Im so glad you got to go to Florida and get some redemption in your race! Rob has knuckle lights but never uses them...I might need to steal them. You definitely have to steal Rob's Knuckle Lights! They're awesome! I absolutely LOVE SUP yoga! I am counting down the days till classes start up again. Although with how cold it is today, it seems like summer is never coming! Congrats on being published! It really does feel like summer will never come! We're getting snow this weekend. Stop the madness! You know I'm ready for shorts weather. I almost think my trip made that worse for me! Ah I've never done SUP before! Looks so fun! It's great that you were able to swing a little getaway. Some Florida warmth and sunshine sounds really nice right about now! Congrats on the Sarasota Half! Looking forward to your recap. Sounds like you had a pretty great trip! I can imagine the core strength it takes to stay upright on a board like that. I know I would be so sore afterward! I love to SUP, but have never tried yoga on it! I can't wait to hear about your race. You should definitely try SUP yoga. It's really amazing on the water like that. I love SUP! I have done a headstand on one, but that's it. It was tough! Congrats on being published! That's so exciting! Have a great week! 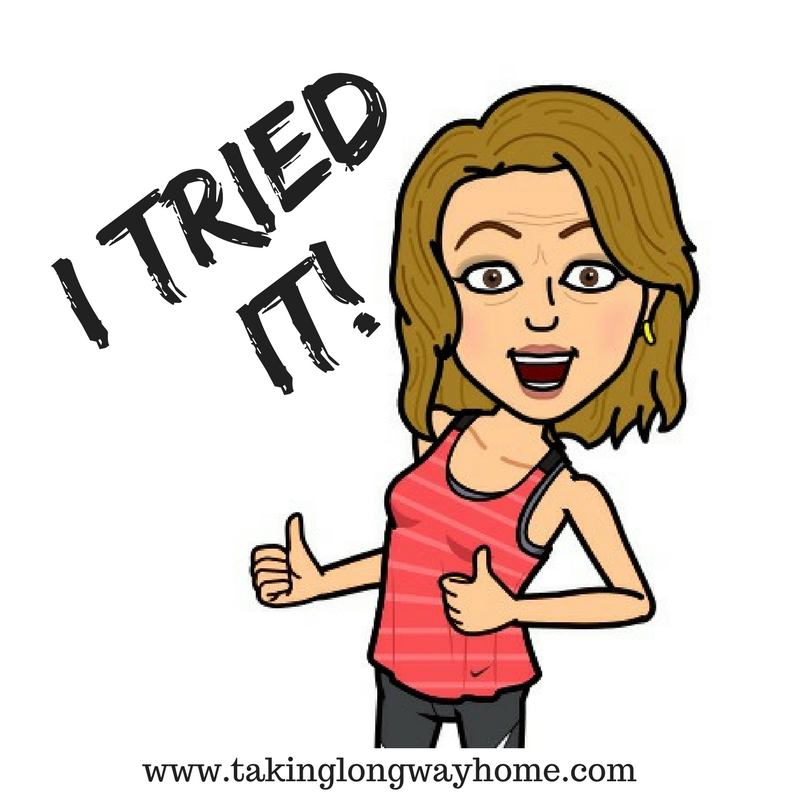 I did a headstand in my class! It's much easier to do that than some of the standing poses. I did SUP yoga last summer and loved it! Hope to get back out this summer again. I hope to do SUP yoga in the summer too! I wish I still got spring break. I am taking a couple days off during our week, but I'm staying home. It's always fun to go someplace warm in winter. It's hard to be an adult and not get spring break and summers off, isn't it? So hoary that you were able to go down to Florida this week and enjoy some sunshine. 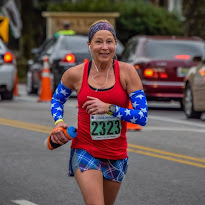 Looking forward to your race recap for the Sarasota Half! I think I should try SUP before I try SUP yoga, but it looks like fun. So does seeing Mary Beth! Congrats on getting your post published! Idk, I think once you get on the board, you should just try it all! Glad you got a chance to relax and unwind in Florida and get a dose of Vitamin MB! Haha! Yes, it was wonderful to see her! Congrats on getting published! I would love a few days in FL sunshine. This winter is never ending! This winter has been the worst! SUP yoga sounds intense!! You are amazing for that skill- and being published!! Congrats!! It's really very relaxing--so peaceful out on the water! SUP yoga looks like fun-challenging but fun! Congrats on being published! I didn't want to fall in this time because it was kind of cool out! But if it's warm, then I don't mind! One of these days I will get to try SUP yoga. I don’t even have the excuse that I live in the desert because my friend April holds classes at the local YMCA pool.Not quite the same as an island, but still... It sounds like you had a great week! Oh, SUP in the pool would be ok too! And you don't have to fear any creepy things swimming in the water! Congrats on being published! I might have to dig out my KnuckleLights for these dark mornings, especially once the grey skies and rain start up again. They would come in handy for that! What a great week! I really want to try yoga SUP! That canal looks like the perfect place to do it. COngrats on getting published and heading over to insta to see how your race went! 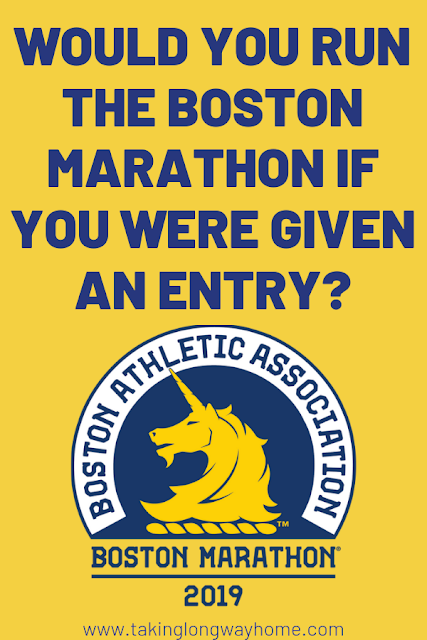 I've signed up for lots of last minute 5Ks but never a half. It's not the first time I've done a half at the last minute but geez, everyone said I was nuts. I guess it's because it was while I was on vacation! SUP yoga! Love it so much! I can't wait until it's a little warmer and I can get back on a board regularly. SUP in general is so fun! I wish I could SUP more often! I just love it! Oh man, I could totally use a little warm weather getaway right about now. Life is crazy and I just need to plop in a beach chair and read and relax! :) I love that you decided to just jump into a race last minute - that's so fun! Looking forward to your recap. I had a lot of downtime in the sun, that's for sure! I'm so jealous of your time in Florida! Glad you and MB got together! I'd love to do SUP yoga but I'm so scared that I'll fall off the board - my balance is terrible! I actually signed up for a half marathon the week of as well - it's the first time I've ever done that! But it'll just be part of my training run, so no goals but to finish! Congrats on your race! You could totally SUP. 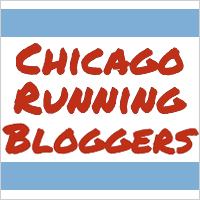 It's all about engaging your core, which we all do as runners. It's so fun! You know, most people impulsively get an ice cream sundae, not run a half marathon, LOL! 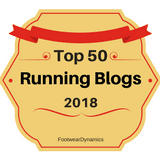 Looking forward to your race recap! Hmmm, you are tempting me A LOT with those Knuckle LIghts - considering I do every single run in the dark, they sound perfect. Haha! There was some ice cream too! I had to burn it off, right? Congrats on being published!! Woohoo! I did SUP once and could hardly move the board! It is tough! I think I would like SUP yoga because I like yoga and was fine balancing on the board, just that it was hard to move with my lack of upper body strength. Typical runner I guess. Knuckle lights are a great idea for the early morning dark runs- I'm more of an evening runner, so this time change is good for me, but I know so many people who run before work and with all the distracted drivers, you can use all the visibility you can get. Glad you had fun in Florida too. The distracted drivers are more of a reason for the lights than anything. If I'm running in the dark, I always run in my neighborhood for safety, and I don't really need the lights to see. So awesome! I can't wait to get back out on the SUP! I miss it so much and I love SUP yoga even more. I love that you signed up for a race on the fly like that. If you're ready for the distance, I think it's a great thing to do! I really like those battery operated knuckle lights. I had the rechargeable ones and after about a year, they just wouldn't recharge any more. I haven't replaced them yet, but I need to get on that. I'm so glad you were able to get some family and friend time at the beach! That had to be a nice break for you! I've always wanted to try out SUP yoga! It's definitely on my to-do list this Spring/Summer! Congrats on your article being published too!! That's so exciting!! 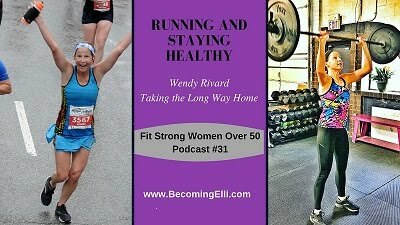 Have a fabulous week Wendy!! I have done SUP but never while doing yoga. SUP is challenging enough, I can't imagine adding another element to that. Sounds fun though! I think SUP and yoga go together well! These classes are held in a little canal, so not too much wavy stuff going on there! 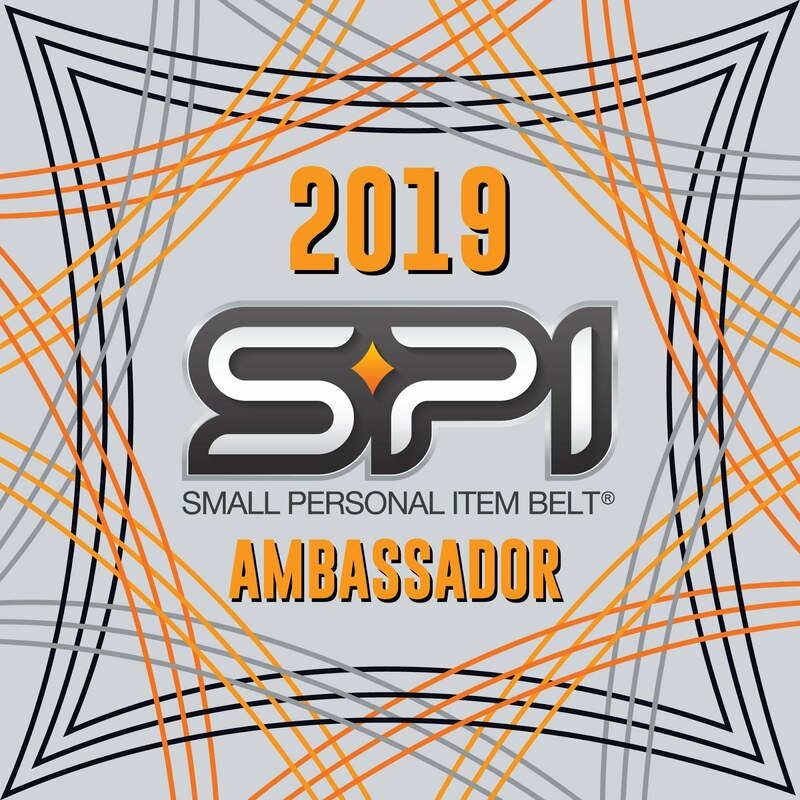 What a fun weekend, and what exciting news about your race! Can't wait to read the full recap! I'll be working on the recap this weekend! It's been a crazy hectic week. I have yet to try SUP but looks like so much fun! Congrats on getting published on that chronic illness website! Super job on your last minute half! We are sunny but not spring-like. And they are calling for snow on Saturday. I think it is fun to jump at a race last min! Those lights look really handy and helpful. Nobody fell in at the class and there were a few first timers there! Wow, what a great week! I’d love to be enjoying the warm Florida sunshine right now, given that it’s currently snowing and everything in the DC area is closed today. I saw your Facebook posts about that race...congrats! I’m glad that it was a successful race for you! I'd love to be back in the Florida sunshine! My trip was too short. Productive week! I need to do more yoga and cross training...badly! Some of my best races are ones that I signed up for at the last minute. I have a few races that I feel like I have unfinished business with too. Debating getting into the MCM lottery. Last time I registered, I got the flu 2 days before the race. Reading about your training week is inspirational. Loved it! Well, thank you! Yes, I hate having unfinished business with a race and this one needed to be done on my terms. Done and done!